Jeremiah looks forward to the time when the people would know God, when God’s law would be written upon their hearts. What is within God (so to speak) was to be revealed interiorly, through the Spirit of God’s Love within our hearts. But for the Spirit to be given, Jesus would have to give-up/sacrifice his life on a Cross. God’s Spirit of Love would reveal itself to be so strong that it would break down any barrier between us and God. Jesus revealed that Love glorifying God when the hour came, when the time came for him to be lifted-up on the Cross. This act of unfathomable and reconciling love is how the Lord not only glorified God but became the Saviour of the world. When we gaze on the Cross we see that at the heart of God is self-sacrificing Love. This Spirit in and of God reveals the full extent of the law. We readily welcome this gift of self from God and from others. But when it comes to our offering ourselves unconditionally and completely it seems counter intuitive. When it’s my turn to offer self-sacrificial love, it appears not to be in my best interests. Why should I give? And If I give, what good is it for me if there is nothing left for me? etc. God is counter-intuitive, unless you die you cannot live to the full. This is the law of Love. And just as God is gloried in self-giving, so are we. It is only when we lose our life that we gain it, and with it eternal life. As Pope Benedict said “God is not solitude, but perfect communion. For this reason, we, made in the image of God, realise ourselves in love, which is a sincere gift of self” (2005). During this Lenten period, we ask ourselves whether we are willing to answer the call of discipleship, meaning that we are to glorify God by revealing God’s Love. 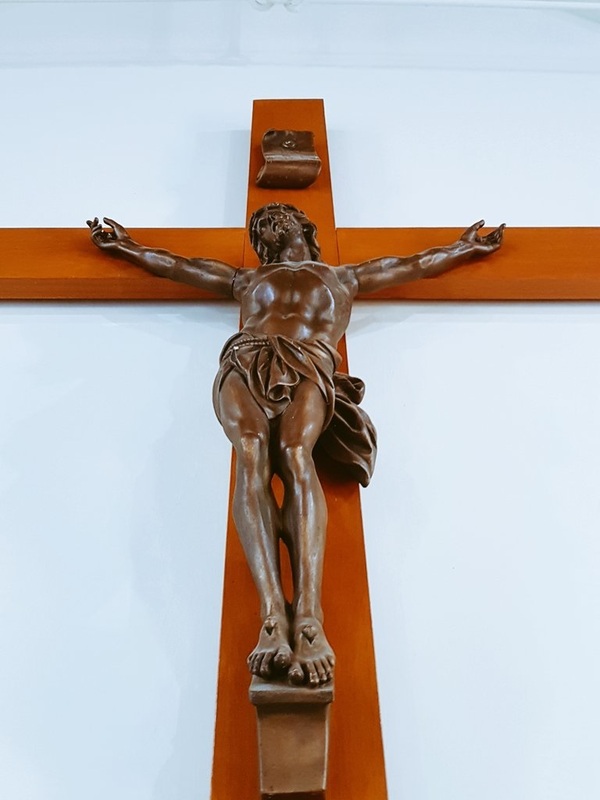 Are we truly willing to give of ourselves in imitation of Christ Crucified? Are we selfless enough to bear the love of God in our hearts and be figuratively lifted-up with the Lord? Are we ready to live in full communion with God and with each other? Yes, God calls us to die and to produce much fruit. This is how we realise ourselves in love and enter the fulness of life. Let us have the courage to say with Jesus, "I am troubled now. Yet what should I say? 'Father, save me from this hour'? But it was for this purpose that I came to this hour. Father, glorify your name."